January of 2017, Beaman Hines, owner of BLH, Inc, Simply Southern Restaurant and Sooey’s BBQ, decided to take on a new venture. With the opportunity of taking over the restaurant located at Seascape Golf Links, Beaman and team decided to try a new type of restaurant to add to the mix. His vision was a place where golfers could come and enjoy a cold beer, cocktail and hearty meal after a round of golf. But it didn’t stop there. He was looking to create an atmosphere in, Kitty Hawk, where locals and tourists could enjoy the gorgeous deck facing the fairway, watch waves roll in over the Atlantic, and meet friends. A gathering place, if you will. 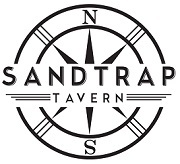 By February, Sandtrap Tavern was created. Known as “the neighborhood Bar & Grille”, the pub-style theme is already becoming a favorite meeting place among locals. Let your taste buds decide between hand-crafted burgers and sandwiches to slow-smoked delicious creations, to a delectably lighter menu featuring fresh salads with local ingredients. The thoughtfully designed menu also offers everything from aged and seasoned prime rib to pork belly bruschetta. Patrons can expect some of the same great southern dishes that Sooey’s and Simply Southern are known for, like slow-cooked, smoked N.C BBQ, Fried Chicken and more. In addition to these staples, Sandtrap is serving up seasonal dishes like stuffed soft shell crab platter, local smoked tuna, Shrimp Po’boy and much more. Stop by next time you are in the “neighborhood” and see what all the hype is about, we promise you will leave more than satisfied! Sandtrap now offers the Sunday Ticket, ACC Network, and The Big 10 Network! Sandtrap has you covered for all of your football needs!